Covestor® Investment Management provides an approach to money management that was previously only available to high-net-worth customers. At their platform, a retail investor can select model stock portfolios that are crafted by proven investors (the model publishers), and have their trades be automatically mirrored in her or his own brokerage account. This empowers these customers with easy and cost-effective access to portfolio management based on the decisions of experienced individuals and registered investment advisors (RIA) of their choice, while they enjoy the transparency of the system and its community-like experience. I am Andy Djordjalian, publisher of a South American-stock model at Covestor. In this article I will present you this model that, I believe, is an informed way to invest in Brazilian stock, as well as equity from other South-American countries. Please have in consideration that Covestor pays me a fee for each client that subscribes to this model. This page is for informational purposes only, all the disclaimers on the model's profile page apply, and please take appropriate professional advice in any investment decisions. Is it safe to invest with Covestor? Several facts support Covestor's claims regarding the transparency and responsibility of their service. An SEC-registered investment advisor themselves, they provide professional personalized advise to each customer, granting them access only to portfolios considered suitable for them. The company manages the mirroring process and summarizes each portfolio's data on individual profile pages. Stocks that trade in low volume, or have a market capitalization that is too small, are excluded from the system as an additional measure of protection. These mechanisms are further explained at Covestor's website and are commented on the extensive coverage that the company has received, with articles in Wall Street Journal, Barron's, Investment News, Financial Times, Wall Street & Technology, Business Wire, MarketWatch and other publications. The trades that are executed in the customers accounts are those that the model publishers perform in their own brokerage accounts (though some trades are not replicated, as explained at Covestor's website). Publishers have their own money at stake in those accounts, and they are also putting their reputation in play. I have worked hard to achieve good past performance in terms of return and volatility. That history brings trust to my model, so I would not like to lose it as much as I would not like to lose money from my account. Regarding the assets, each customer's shares are held in their own brokerage accounts with Interactive Brokers. You can verify that Covestor is properly regulated by using this tool and you can check the same for the brokerage firms with the use of this other one. Latin America is one of the most rapidly developing regions in the world. Rich in resources, with mature financial institutions, political stability and a thriving middle class, Brazil and much of the rest of South America have excelled financially in recent years. The region produces commodities that are in high demand because of the industrialization and urbanization of Asian emerging economies, like metals (e.g., iron ore, copper, zinc, silver, tantalum, palladium and lithium), petroleum and grains. As a consequence, it is receiving large inflows of capital. Foreign reserves at the Central Banks have been enlarged thanks to these, which, combined with a more responsible fiscal policy, configure a financial outlook that differs significantly from the crisis and debt problems of the past. The Brazilian and South American potential is not limited to commodity exports driven by Chinese and Indian economies. The region has considerable domestic consumption, more per capita than average in emerging markets. Moreover, the consuming middle class is growing, thanks to the commodities boom and to the process of social change that these countries have been undergoing for many years. In addition, it has reserves of gold and other precious metals, plus some emerging world-class exports with significant value added. For example, aircraft from Brazil's Embraer, which has recently become the third-largest producer in the world in terms of yearly delivery, and wine from Argentina and Chile, countries that are its fifth and ninth producers, respectively. Thanks to these various opportunities for profit, investments in the region can be diversified. For these reasons, I believe that Brazilian stock, combined with equity from other countries in South America, are excellent components for the portfolios of US and global investors, that can strengthen those investments with profit potential and diversification. I have lived in Argentina all my life, immersed in the regional environment and following business publications in Spanish and Portuguese for many years. When the people at Covestor invited me to publish a South American model, I agreed that it may result in an interesting product for their clients, and accepted. We started the South America model (A:DSAV) in early December of 2009, and it has been working comparatively well since. The model provides a means for U.S. citizens, and foreigners with accounts in the U.S., to invest in South America, because it is composed of ADR's that correspond to South-American stocks, plus stocks that are not ADR's but belong to companies that have a majority of their operations in the region, plus Latin-America ETF's and closed-end funds (CEF's). All of these are traded in U.S. exchanges (i.e., NYSE, NYSE Arca and NASDAQ). The resulting portfolio is an alternative to state-of-the-art Latin-American investment vehicles, with their positive aspects but also some differences that are, hopefully, improvements. By “state-of-the-art vehicles”, I mean top Latin America mutual funds like Fidelity Latin America (FLATX), T. Rowe Price Latin America (PRLAX) and BlackRock Latin America (MDLTX), the largest Latin America ETF iShares S&P Latin America 40 Index (ILF), and the top Brazil ETF's iShares MSCI Brazil Index (EWZ) and Market Vectors Brazil Small-Cap ETF (BRF). These six funds add up to more than $20 billion in assets and are leading products for investors interested in the region. The Covestor system has a critical advantage over those funds: the possibility to trade more flexibly. Successful funds manage so much money that their trading costs are quite high, unless they trade very liquid securities or do it in small portions. With the Covestor platform we are much less restrained, because the assets that are behind each model do not add up to hundreds of millions of dollars. That advantage creates opportunities. Some publishers at Covestor use it to offer interesting, speculative portfolios, focused on small caps, long and short, etc. But I decided to adopt a lower-risk approach, by combining this flexibility with a good level of diversification, in an attempt to obtain a result that is somewhat better than that of the aforementioned state-of-the-art funds. I think a small outperformance is a healthy objective, because accumulated over time it can make a big difference, without the need to take as much risk and depend on good luck as more speculative investments require. The South-American theme offers enough profit potential by itself, there is no need to focus on few stock. Therefore, my model is diversified, I do not trade very often and I generally keep it fully invested and always long only (meaning that I do not bet on shares going down, for the reasons explained in this four-part article). Weighting based on top-down analysis, not constrained by market caps. To alleviate their trading costs, most big funds have the greater part of their portfolios in liquid companies with high market capitalizations. That often leads to questionable levels of diversification. For example, iShares MSCI Brazil Index (EWZ), the largest Brazil ETF, has currently a 37% of its portfolio tied to only two companies, Petroleo Brasilero (Petrobrás) and Vale. Even though these are good companies that have done well, an investment in Brazil can be diversified much better. Moreover, let's consider that, when people pay fees for a passive fund instead of buying shares from a few companies, they do it to obtain diversification. I wonder if all of EWZ's investors are aware of the real value they are getting in exchange for the fees they pay. . . The big Latin-American stock funds are also heavily biased towards market-cap weighting. For example, Morningstar currently reports that FLATX, PRLAX, MDLTX and ILF have just a 13.4%, 8.5%, 6.7% and 15.8%, respectively, in stock from countries other than Brazil and Mexico (EWZ and BRF are Brazil-only funds), despite the profit and diversification potential offered by those other countries. For South America Focus, weighting is decided after a top-down analysis that uses market caps as one of many elements. Brazil is still dominant, and I give much consideration to Petrobrás and Vale, but I aim at obtaining better diversification by making more extensive use of stock from other countries and from less-capitalized companies. A fixed-income allocation. To diversify more, I allocate about a 15% to 20% of the model in fixed-income instruments. Emerging-market bonds have performed very well in the past decade, and even though the developing countries are in relatively-good financial standing, they are still paying higher interest than developed economies. Closed-end funds (CEFs). I use CEFs for the fixed-income allocation (there are none for South-American debt only, so I use emerging-market debt funds, which have a portion of their portfolios in South-American bonds). As with all CEF investments, there is an additional potential for profit besides the increase in value of the underlying assets per share (also called Net Asset Value or NAV), which is the improvement of their market price relative to their NAV. With open-ended funds, like mutual funds and ETF's, the market price and the NAV are about equal all the time, but with CEFs they are not, which constitutes an additional opportunity to buy low and sell high. Junior mining. Several junior mining-exploration companies, that search for precious and industrial metals, operate in Latin America, but they are not held by big funds because they are incorporated elsewhere and trade in volumes that are not large enough. Covestor South America does include them. About a 9% of the portfolio is currently assigned to Canadian junior explorers, plus an 8% that is allocated to a larger miner from the same country. These holdings are an opportunity for profit and diversification that is absent in the funds mentioned before. It is not necessarily an advantage, but Mexico is not included. The model covers South America only. Therefore, although it is not a one-country instrument like EWZ and BRF, it does not include Mexico like the Latin-America funds. This figure shows the performance of the first six months of the model portfolio, from December 3, 2009 to the day of the latest update of this report, August 19, 2010. It is compared to the top Latin-American mutual funds and ETF's that were mentioned before, displaying a noticeable outperformance. It has not been a good period for Latin-American equity in general. Nevertheless, Covestor South America offered a positive result, unlike six of the seven popular funds that were analized. This was not a one-event out-performance, the model performed better during most of the 9 months under analysis. Since early December it has been fully invested, with the exception of a very small cash allocation and occasional to-be-credited cash. Therefore, this result is not explained by market timing or by a lucky burst in one or a few stock picks. The aforementioned advantages offer a better explanation, particularly the control of risk obtained through proper diversification, with the use of Chilean and Peruvian stock, fixed income CEF's and precious-metal miners. The reported performance of the Covestor portfolio was taken from its profile page, which does not include the fees collected by Covestor (1.50% annually) and the trading fees (which, as far as I know, are currently $1 per transaction on Interactive Brokers accounts or $8 with TD Ameritrade), although it does include the taxes I paid on dividends (a 30% as I am a foreign citizen) and the trading fees that I paid for my account's transactions. To enter the model, 15 purchases are currently required and, besides those, we have been having around 2.7 transactions per month, which should be about normal. 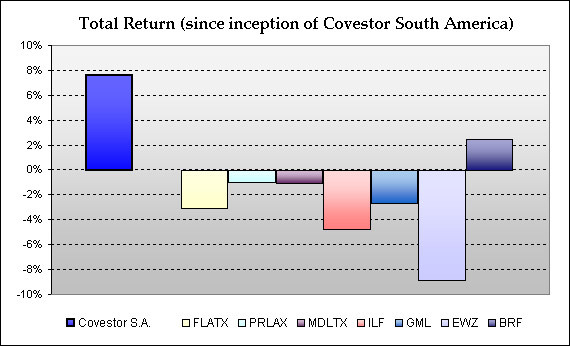 BlackRock Latin America (MDLTX) has a 5.25% front load that has not been deducted from its return in the graph. Performance data for the funds were obtained from Morningstar and Yahoo Finance. 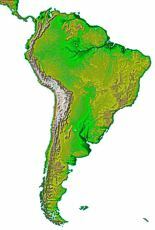 For more information, you may visit the Covestor South America profile page. Please bear in mind that past performance is no guarantee of future results and that this comparison is not long term. In future articles we will compare risk metrics and quarterly results. If you are interested in receiving those updates, please subscribe to our email list or news feed. Portfolios offered through Covestor can have more flexible trading than big mutual funds and ETF's. My South-American portfolio uses this advantage to reduce risk by better diversification, and to try to exploit mispricing that, presumably, occurs in some stocks that are not traded in massive volume, such as fixed-income closed-end funds and junior-mining shares. For example, if we were to favor large-cap companies incorporated in Latin America as much as the regional mutual funds and ETF's do, we would have only one stock (Peruvian Minas Buenaventura's) to invest in precious-metal producers. Latin-America funds typically allocate just a 1% to 2% in this business, doing it through that company. But it is disadvantageous to have so little when there is more precious-metal mining in Latin America and this business is a good diversifier. For South America Focus, I am monitoring Minas Buenaventura but other companies as well. The model currently holds some Canadian miners that operate in the region, producing and exploring for precious and industrial metals. These are Silver Standard Resources (SSRI), Exeter Resource Corp. (XRA) and Solitario Exploration & Royalty (XPL). The popular, large funds may perform better during periods of time when large-caps like heavyweights Petróleo Brasilero (PBR) and Vale (VALE) soar, if these stock outperform the positions we have for diversification purposes. But South America Focus would work comparatively better in many other, probable scenarios. By earning a good share during the “up” periods and losing less during the “downs”, it may offer greater, more stable returns in the long run. That is why I believe it to be a good vehicle to invest in one of the most developing regions of the world, and to add diversification and profit potential to a U.S. or global investment portfolio. If you are interested, you can visit Covestor and, particularly, this model's profile page at their site, where you can browse through performance data and graphs, or read the monthly commentary. Consider opening an account with Covestor, there are many other models to subscribe to. Its variety can be used to assemble a diversified investment that covers various themes. I am planning to expand the coverage of this model at SimpleStockInvesting.com, as well as to write more about investments in this region and Latin America & Brazil ETF's and mutual funds, so you may be interested in subscribing to the updates. Thank you for your interest. I wish you the best in your pursuit of financial success! 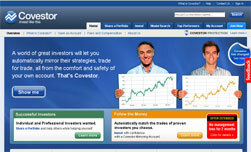 "Invest in Brazilian &amp; Latin-American Stocks with Covestor Investment Management"